Life of a mad typer: Earth's Daughter Nature's Blender review. 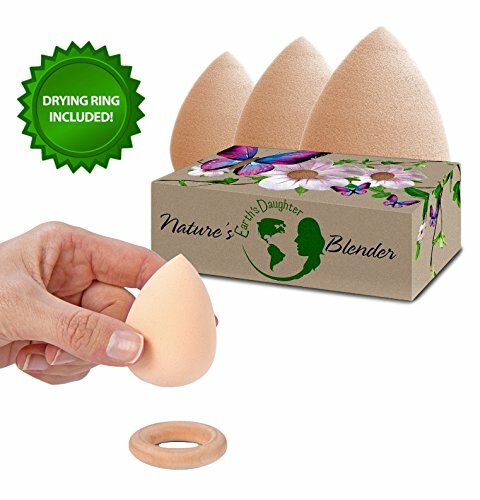 Earth's Daughter Nature's Blender review. THREE NATURE'S BLENDERS WITH BONUS STAND - It took a lot of time and research, but we finally managed to create the perfect sponge that is thick enough to last and soft enough to achieve the texture and finish you want. We've include three blenders in this set so you don't have to break the bank for professional results. You can get a quality 6 month supply (or longer) with just this one purchase. Now includes a convenient and hygienic holding and drying stand made of smooth all natural wood. NON-IRRITATING SPONGE - Our blender is latex-free, hypoallergenic, and naturally colored (because dyes can't be all that good for your skin, right?). It has an amazingly soft, suede texture for flawless application and is perfect for sensitive and/or delicate skin. MULTIPLE APPLICATIONS - Use Nature's Blender for your foundation, concealers, serums, and mineral and cream cosmetics. It can blend anything you want and is sure to provide you with amazing results. Instructions are included on the back of the box, which can also be found below under "Important Information." FOR A GOOD CAUSE - At Earth's Daughter we believe very strong in helping others, that's why we donate at least 5% of our profits to charity. When you make a purchase with us you not only get a great deal and the product you've been looking for, you help make the world a better place. INCLUDES GUARANTEE - If you are not satisfied with your blender or blenders at any point in time 6 months after your purchase, we will give you a refund in full. No questions asked, no hard feelings. That is how confident we are in the purity of our product.